Are you a serial doodler or do you pride yourself on setting trends through your own unique style? 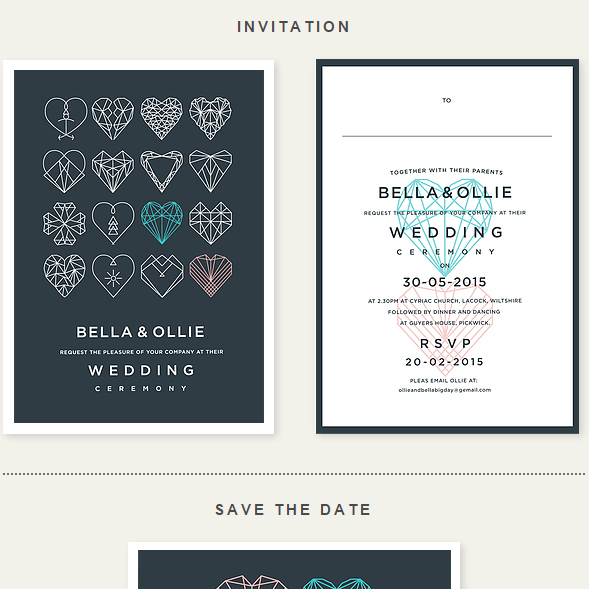 If so, look no further than the Heart to Heart wedding stationery suite from The Invite Guy! This awesome wedding suite screams creativity, style, love and quirkiness, all in a simple yet highly effective and clutter-free design. The striking geometric heart design instantly catches your eye as you open up this invitation, making it perfect for loved up couples who don’t necessarily conform to the ‘norm’. Whether you’re a loved-up twosome who loves nothing more than to showcase their love with regular public displays of affection (much to Granny Betty’s dismay) or a couple who prefers to keep everything discreet and behind closed doors, the Heart to Heart is a unique design that will suit every taste and preference. Not sure on the colour or wording? Luckily for you we’re able to completely customise this design, even down to the paper stock, so if you’d like to use your favourite colour or tie it in with your bouquet or bridesmaid’s dresses, we won’t stop you! Equally, if you’d like to invite your guests in your own choice of wording, that’s absolutely fine too! With the Heart to Heart collection you’re free to choose your exact wording and keep it as short and sweet or lengthy and detailed as you like! *Top tip: Looking for a fun and easy way to seat your guests? Why not take advantage of the different heart designs and use them as your designated tables? Cute!